Valid for all active, reserve, National Guard, and retired military personnel plus active and retired police and firefighter personnel, including volunteer firefighter and Border Patrol. January 1 – February 28, 2019. Not an owner yet? Become a member now and share in the fun and this exclusive offer. Join here. Valid for all current IMRG members from January 1 – January 31, 2019. *The no payment no interest offer valid on any new, previously untitled 2018 Heavyweight Indian Motorcycle. Financing offer available through Performance Finance (PF), a loan production center of Evergreen Bank Group, and is subject to credit approval by PF. Offer available to well-qualified applicants only; your actual terms may vary. Not all buyers will qualify and if approved may receive a higher rate, depending on credit score. Where no money down is indicated, it is available only to those well-qualified applicants with approved credit. Some buyers will require a down payment in order to receive credit approval. No interest until June 2019 and no payments until July 2019. Annual Percentage Rates (APR) of either 4.99% or 5.99% for 60 month terms begins June 2019. Rates are available to qualified applicants only and determined by credit score. Not all buyers will qualify for this promotion and if approved may receive a higher rate with principal and interest payments beginning immediately. Some buyers will require a down payment in order to receive credit approval. Offer valid January 1 – February 28, 2019. Not valid with other financing offers or trade-in offers. Other terms, conditions and limitations may apply. Subject to model availability and dealer participation. Financing offer can change or terminate at any time without prior notice. Finance offer valid through authorized U.S. Indian dealers only. Please see your local authorized Indian dealer for program details. **This is a limited time offer which is valid for the purchase of selected qualifying models and is subject to credit approval on qualified purchases financed during this program. Offer may not be combined with certain other offers, is subject to change and may be extended or terminated without further notice. Offer valid on a new 2018 Heavyweight Indian® Motorcycle. Monthly payment and cost of borrowing will vary depending on amount borrowed and down payment/trade. Minimum amount to finance is $5,000. Example: $20,000 financed at 2.99% over 60 months = 60 monthly payments of $359.28 with a cost of borrowing of $1,557.10 and a total obligation of $21,557.10. An example of monthly payments required on a 60-month term at 2.99% APR is $17.96 per $1,000 financed. Monthly payment examples do not include taxes, title, and other fees. Indian Motorcycle® is a registered trademark of Indian Motorcycle International, LLC. Always wear a helmet, eye protection, and protective clothing and obey the speed limit. Never ride under the influence of drugs or alcohol. ©2018 Indian Motorcycle International, LLC. Offer Valid January 1 – Febraury 28, 2019. *The no payment no interest offer, valid on any new, previously untitled 2018 Midsize Indian Motorcycle. Financing offer available through Performance Finance (PF), a loan production center of Evergreen Bank Group, and is subject to credit approval by PF. Offer available to well-qualified applicants only; your actual terms may vary. Not all buyers will qualify and if approved may receive a higher rate, depending on credit score. Where no money down is indicated, it is available only to those well-qualified applicants with approved credit. Some buyers will require a down payment in order to receive credit approval. No interest until June 2019 and no payments until July 2019. Annual Percentage Rates (APR) of either 4.99% or 5.99% for 60 month terms begins June 2019. Rates are available to qualified applicants only and determined by credit score. Not all buyers will qualify for this promotion and if approved may receive a higher rate with principal and interest payments beginning immediately. Some buyers will require a down payment in order to receive credit approval. Offer valid January 1 – February 28, 2019. Not valid with other financing offers. Other terms, conditions and limitations may apply. Subject to model availability and dealer participation. Financing offer can change or terminate at any time without prior notice. Finance offer valid through authorized U.S. Indian dealers only. Please see your local authorized Indian dealer for program details. ***This is a limited time offer which is valid for the purchase of selected qualifying models and is subject to credit approval on qualified purchases financed during this program. Offer may not be combined with certain other offers, is subject to change and may be extended or terminated without further notice. Offer valid on a new 2018 Midsize Indian® Motorcycle. Monthly payment and cost of borrowing will vary depending on amount borrowed and down payment/trade. Minimum amount to finance is $5,000. Example: $11,499 financed at 0.0% APR over 60 months = 60 monthly payments of $191.65 with a cost of borrowing of $0.00 and a total obligation of $11,999. An example of monthly payments required on a 60-month term at 0.0% APR is $16.67 per $1,000 financed. Monthly payment examples do not include taxes, title, and other fees. Indian Motorcycle® is a registered trademark of Indian Motorcycle International, LLC. Always wear a helmet, eye protection, and protective clothing and obey the speed limit. Never ride under the influence of drugs or alcohol. ©2018 Indian Motorcycle International, LLC. Offer Valid January 1 – February 28, 2019. ****This is a limited time offer which is valid for the purchase of selected qualifying models and is subject to credit approval on qualified purchases financed during this program. Offer may not be combined with certain other offers, is subject to change and may be extended or terminated without further notice. Offer valid on a new 2019 Heavyweight Indian® Motorcycle. Monthly payment and cost of borrowing will vary depending on amount borrowed and down payment/trade. Minimum amount to finance is $5,000. Example: $20,000 financed at 3.99% APR over 36 months = 36 monthly payments of $590.39 with a cost of borrowing of $1,254.07 and a total obligation of $21,254.07. An example of monthly payments required on a 36-month term at 3.99% APR is $29.52 per $1,000 financed. Monthly payment examples do not include taxes, title, and other fees. Indian Motorcycle® is a registered trademark of Indian Motorcycle International, LLC. Always wear a helmet, eye protection, and protective clothing and obey the speed limit. Never ride under the influence of drugs or alcohol. ©2018 Indian Motorcycle International, LLC. Offer Valid January 1 – February 28, 2019. *****This is a limited time offer which is valid for the purchase of selected qualifying models and is subject to credit approval on qualified purchases financed during this program. Offer may not be combined with certain other offers, is subject to change and may be extended or terminated without further notice. Offer valid on a new 2019 Midsize Indian® Motorcycle. Monthly payment and cost of borrowing will vary depending on amount borrowed and down payment/trade. Minimum amount to finance is $5,000. Example: $11,499 financed at 2.99% APR over 60 months = 60 monthly payments of $206.57 with a cost of borrowing of $895.25 and a total obligation of $12,394.25. An example of monthly payments required on a 60-month term at 2.99% APR is $17.96 per $1,000 financed. Monthly payment examples do not include taxes, title, and other fees. Indian Motorcycle® is a registered trademark of Indian Motorcycle International, LLC. Always wear a helmet, eye protection, and protective clothing and obey the speed limit. Never ride under the influence of drugs or alcohol. ©2018 Indian Motorcycle International, LLC. Offer Valid January 1 – February 28, 2019. RESTRICTIONS: $500 USD / CND savings redeemable with proof of ownership and trade-in of a 750cc or larger motorcycle and proof IMRG membership. Coupon is not redeemable for cash. Coupon can be combined with any rebates, special fi nancing, or other coupons (i.e., Honoring Heroes). Limit one coupon per customer. 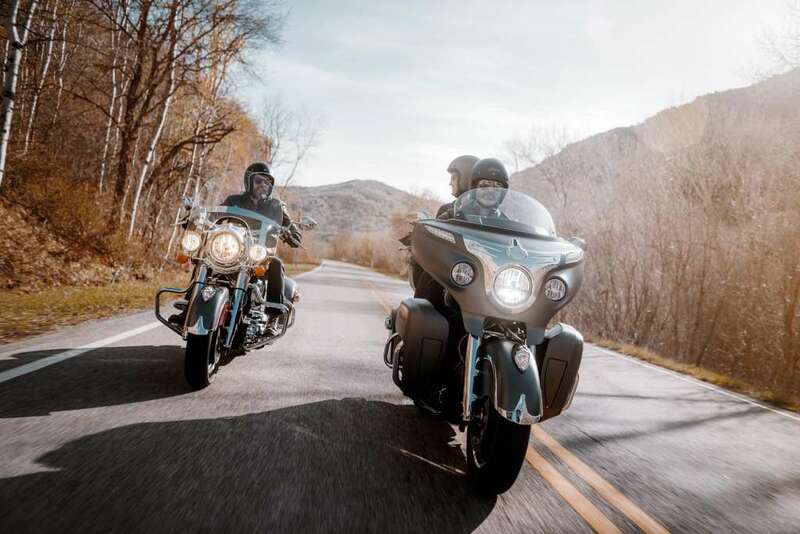 Off er is valid on 2018 and 2019 Midsize Indian Motorcycle® models. Off er valid in the United States and Canada. Motorcycle must be purchased at a dealership in the United States and Canada and registered in those respective territories. Off er maybe cancelled at any time. Must take delivery from new dealer stock. See dealer for details. Indian Motorcycle® is a registered trademark of Indian Motorcycle International, LLC. Always wear a helmet, eye protection, and protective clothing and obey the speed limit. Never ride under the infl uence of drugs or alcohol. ©2018 Indian Motorcycle International, LLC. Offer valid January 1st – January 31st, 2019.